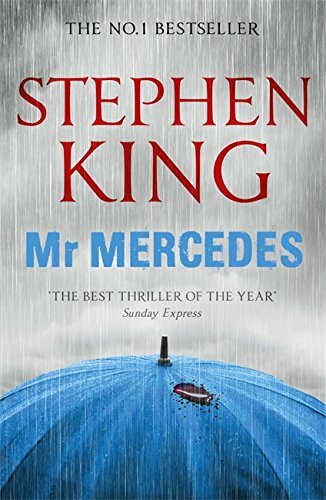 The Sunday Express said that this novel, Mr Mercedes by Stephen King, was’the best thriller of the year’. Stephen King has written over fifty worldwide best-selling books. Mr Mercedes was the first novel of his to feature the character, Bill Hodges. Several of Stephen Kings books have been made into films such The Shawshank Redemption. King was shortlisted for the CWA Gold Dagger Award for Mr Mercedes and won the prestigious Edgar Award for best novel for it. Mr Mercedes was also awarded the Goodreads Choice Award for the Best Mystery and Thriller of 2014. Stephen King has also been awarded the National Book Foundation Medal, the National Medal of Arts and the Grand Master Award from the Mystery Writers of America. No doubt, like many police officers Bill Hodges, cannot forget the cases that he couldn’t close. One particularly unpleasant case remains at the forefront of his mind. Early one morning at the opening of a jobs fair, eight people in the line-up of hundreds were killed. They were killed by a madman who drove a stolen Mercedes into them. The deceased just wanted to improve their lives and the lives of their families on that morning and yet, their lives would cease that fateful day. The horror of that day and the killer at large haunts Hodges. Then one day the fire is re-ignited in him. He receives a letter from someone claiming to be the killer. He says he will kill again. Bill Hodges had never liked to see a criminal get away with a crime. He was intent that this killer would not repeat his crime, retirement or no retirement, he was going to get him! Brady Hartsfield is intent on killing again, taunting Hodges just adds some spice to the event. This time he is intent on killing many more. Hodges and his buddies will do everything they can to catch the killer before it is too late. This is a beautifully crafted novel with three dimensional characters and a fast paced, page turning plot from one of the masters of the craft. Take the time to read this novel, Mr Mercedes, you will not be disappointed. Mr Mercedes by Stephen King is available at World of Books.